Wishing everyone exciting and safe New Year’s Eve adventures, and a wonderfully epic 2011! Last Chance for the Seaside Spectacular! BEFORE THE age of homogenization and micro-machinery, before the tyrannous efficiency of internal combustion and the domestication of electricity, lived beautiful, monstrous machines that lived and breathed and exploded unexpectedly at inconvenient moments. It was a time where art and craft were united, where unique wonders were invented and forgotten, and punks roamed the streets, living in squats and fighting against despotic governance through wit, will and wile. Even if we had to make it all up. 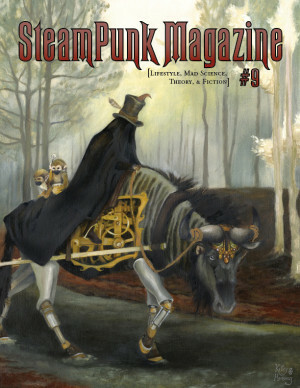 SteamPunk Magazine is a publication that is dedicated to promoting steampunk as a culture, as more than a sub-category of fiction. It is a journal of fashion, music, misapplied technology and chaos. And fiction. It just may be the most spectacular magazine to ever fight against the spectacle, and it is free. Or as cheap as we can possibly get it to you. Using the latest in Creative Commons technology, we undermine the fascism of copyright while protecting ourselves from direct co-option. We sell the magazine for as close to cost as we can manage, and we offer it for free PDF download for printing at home.